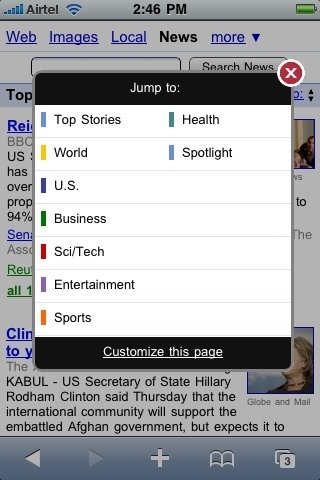 Google News for Mobile updated for iPhone, Android, and WebOS | Android Blast! Google has updated their Google News for Mobile to provide a consistent experience for mobile users no matter what the platform. The news broke on Google's Official Mobile Blog with the following post. Now all platforms will have a similar experience like Windows Mobile, BlackBerry and Symbian have had for awhile. This new version provides the same richness and personalization on your phone as Google News provides on desktop. Our new homepage displays more stories, sources, and images while keeping a familiar look and feel. Also, you can now reach your favorite sections, discover new ones, find articles and play videos in fewer clicks. If you are an existing Google News reader on desktop, you will find that all of your personalizations are honored in this mobile version too."